It is acknowledged internationally that poor nations are likely be more severely affected by climate change and ecological instability than others because they have fewer resources available to cope with the ensuing challenges and threats. 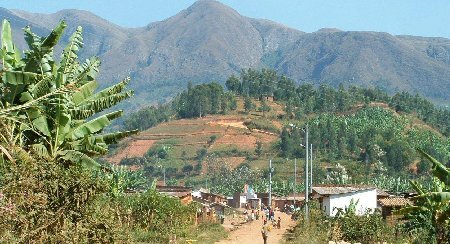 Burundi’s environment is as much affected by climate change as any other country. The recent lengthy civil war has also taken its toll on natural resources. It has become imperative that action is taken to prevent the exploitation of resources and to address environmental concerns. National, regional and global environmental initiatives provide the Church with opportunities to work collaboratively with the Government and other agencies and organisations. The reforestation project aims to conserve and manage land and environmental resources for farmers through the provision of tools and materials, procurement of seedlings, establishment of nurseries and planting of trees. Throughout the dioceses millions of trees have been nurtured in nursery beds. Beneficiaries are given management skills and reforestation techniques to ensure the care and protection of the trees. Annually a variety of trees are planted out; an activity that involves and benefits the whole community. Priority has also been given to disaster management and response in order to prevent excessive soil erosion and loss of crops. Across wide areas of land trenches have been dug and managed to deal with excess water. Young people in particular are being encouraged to accept responsibility for their environment. A number of secondary schools now have environment clubs that provide opportunity for students to understand some of the issues relating to the environment and climate change. The Province has maintained a holistic approach to issues of the environment that impinge on areas of health, malaria prevention, and community and family development. The Church has the opportunity to engage with the community at all levels, especially with local government, schools, the military, as well as the general population. Projects are a vehicle for reconciliation as people cooperate and work together and set an example to children and youth.